In the case of old units and measures it is worth remembering that any precise definitions was in many cases not established until the nineteenth century. Also, many units which might have a precise meanings today such as a 'barrel', formerly had a variety of special meanings when applied to particular commodities so that a 'barrel of water', 'barrel of peas' and a 'barrel of oil' would be totally different. Today the system used in Sweden is the metric. It came to Sweden from France where it was introduced during the French Revolution, in 1793. Napoleon introduced this system in every country he occupied. Sweden did not adopt the metric system before 1878 and it would be introduced over a 10-year period. From January 1, 1889 the only legal measurement system in Sweden was the metric. Despite all the measurement reforms, the old measures lived on in people's minds for a very long time who continued to think in feet instead of meter, kanna instead of liters, etc. The new dimensions were difficult to understand, they meant nothing, while the old one had a meaning. Even today, many of these older measurements remains alive in people's minds. 1 Foder = 2 pipor = 4 oxhuvud = 360 kannor = 942,4 liter. 1 Pipa = 2 oxhuvud = 180 kannor = 471,2 liter. 1 Oxhuvud (hogshead) = c. 70 to c. 90 kannor depending on substance (183—235 liter). Particularly for wine. 1 Balja = 50-100 liter. 1 Fat (barrel) = 1 Åm = 4 ankare = 60 kannor = 157 liters. Sometimes a Fat was called Helfat, why then a halvfat was about 78.5 liters. 1 ankare (anchor) = 1/4 Åm = 15 kannor = 39.25 liters. Often as a unit for wine, beer and spirits. 1 Fjärding = 12 kannor = 31.4 liters. 1 Kanna = 2 Stop = 2.62 liters. Old Swedish unit for both wet and dry goods. From year 1665 regulations 1 kanna = 2.617 liters. For wet products was 1 kanna = 1/48 Tunna = 2 stop = 8 kvarter = 32 jungfrur (ort). For dry goods was 1 kanna = 1/56 tunna (for dry goods) = 4/7 kappe. 1 Kvarter = 1/8 kanna = 1/4 stop = 4 jungfru = 32.7 cl. Until today still common in soft drink cans and bottles. 1 Jungfru = 1/4 kvarter = 1/16 stop = 1/32 kanna = 8.2 cl. The official name was ort. Used mostly for spirits. The name jungfru (maiden) is considered to come from the fact that the actual measures often was in the shape of a truncated cone that could resemble a woman with ankle-length skirt. 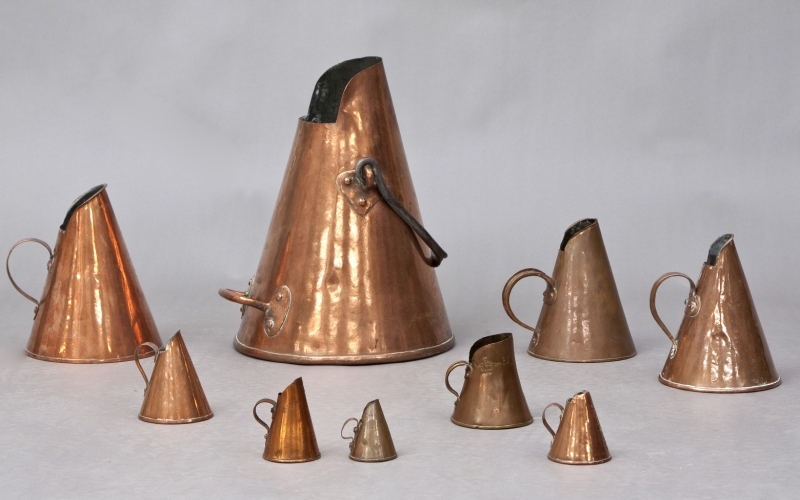 19th century, possible some older, copper measures, from jungfru and upwards. 1 tunna = 2 spann = 8 fjärding = 32 kappar = 56 kannor = 146,6 liter level measure or 164.9 liters full measure. With "level measure" is meant that the pitcher or barrel have been leveled off without packing or shaking. It was also called löst mått (unpacked). With "full measure" meant that for each level measure, you needed to add some more. How much varied but was usually about 16 percent. In the 1700s, to each tunna (barrel) was to be added four leveled off kappar. The dimensions below are in leveled measures. 1 skäppa = 1/6 tunna i Småland, = 1/4 tunna (36,6 liter) i Bohuslän, = 1/5 tunna i Västergötland. Unit in use since the 13th century, discontinued in 1735. The size of a skäpa varied by region. 1 spann = 2 halvspann = 1 halvtunna = 4 fjäding = 16 kappar = 28 kannor = 73,28 liter. 1 fjärding = 4 kappar = 7 kannor = 18,32 liter. 1 kappa/kappe = 1,75 kannor = 4,58 liter. 1 kappe = 1/32 tunna (för torra varor) = 1/16 spann = 7/4 kanna = 4,58 liter. After the introduction of the metric system in Sweden kappe have sometimes been used to mean 5 liter. 1 kanna = 2 stop = 2,617 liter. 1 Skeppspund = 4 centner = 20 Lispund = 400 skålpund = 170 Kg. 1 Lispund = 1/20 skeppspund = 20 skålpund = 40 mark = 8,502 kg. 1 Mark = 1/2 skålpund = 212,5 g.
A catty was a weight unit of the colonial period in East and Southeast Asia, originating as the kati in Malaya. The catty varied a little from market to market. Typically it was equal to about 4/3 pound avoirdupois (604.79 grams), and it is still equal to that weight in Malaysia. In China, the catty was identified with the traditional jin unit of weight, comparable to the English pound. Traditionally, it was divided into 16 liang. In this paper the Catty will be translated as one hundreth of a Pekul being equal to 59.68 kg (596.8 grams). A picul, or pecul as it was written in the SOIC documents, was a unit of weight comparable to the European quintal. It was equal to 100 catties, typically about 133.3 pounds or 60.5 kilograms. In recent years the picul has been used as a metric unit equal to 60 kilograms (132.28 pounds) in Thailand or 50 kilograms (110.23 pounds) in China. The unit is pronounced "pickle."